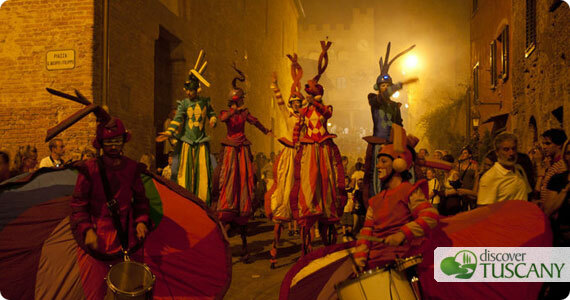 Mercantia 2012, Certaldo:Don't Miss The most Important Steet Art Festival in Tuscany! Blog / Events / Mercantia, Ready to Enter a Fabulous World? Mercantia, Ready to Enter a Fabulous World? 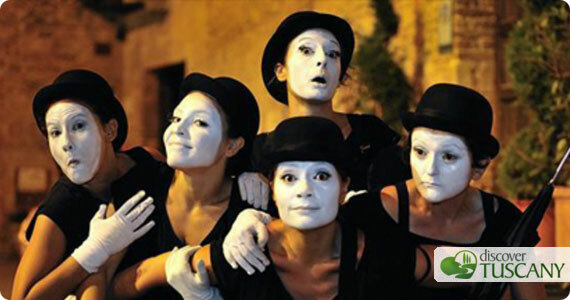 Mercantia, the most important festival dedicated to the street theatre and to art in all its manifestations, returns this year in its 25th edition. The Festival will run from July 11 throughout July 15, 2012 in the splendid medieval village of Certaldo, homeland of the writer and poet Giovanni Boccaccio. It’s not easy to explain the magic atmosphere you can breath within the enchanting medieval village of Certaldo during these 5 unforgettable nights, we highly recommend you to head to the festival and experience it. The town turns into a magic world, as the one you imagine reading a fairy book. Art is everywhere at Mercantia, it is in the live performances, in the theatre shows, in the museums, in the air you breath. Each space, small or big, vertical or horizontal turns into a perfect stage on which exciting exhibitions, able to satisfy both adults and kids, are performed. This year the secret gardens within the city, will offer an intimate and welcoming atmosphere perfect for hosting suggestive shows dedicated to a limited public. The Arts and Crafts market is together with the theatre, definitively the other important and indisputable protagonist of the festival. Here many artisans will also have the opportunity to show and sell their handmade artifacts. The Collective Game, is this year the main theme of Mercantia, even if, the festival has actually always been a huge collective playground and the public the undisputed protagonist of the entertainment. The Divine Comedy by Dante Alighieri will be read accompanied by music at the Augustinian Cloister of the town. At the Palazzo Pretorio and at the House of Boccaccio you can visit the exhibition “Hohò” where contemporary art have a dialogue with the most famous work by Boccaccio, The Decameron. 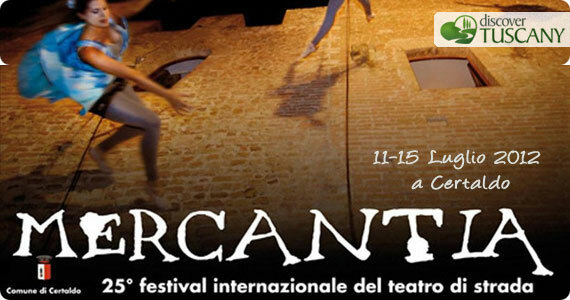 Mercantia 2012 offers a very huge program, visit the official website of the event to read it! Who got a smartphone can easily download here the App dedicated to the events calendar of Mercantia. To get more info on reduced tickets and passes check the official website out! From Florence take the highway A1 Pisa-Livorno, exit Empoli ovest, than take the state highway 429 in the direction to Siena. From Siena take the freeway Siena-Firenze, exit Poggibonsi, than take the state highway 429 in the direction to Empoli. Line Florence- Siena get off at the stop Certaldo. Have a nice journey through the splendid world of Mercantia!